Book Blog Memes / Get Your TBR List Ready! Ten Books I’m Looking Forward to in 2015…so far. It’s crazy to be thinking about new releases for 2015 when I’m rushing to get in my last few picks for 2014. But The Broke and The Bookish asked, so I’m playing along. I went through my Edelweiss tags and could only get through March because there are just sooo many good ones. So after reading each and every synopsis (of more than 60 that I tagged) I narrowed it down to these beauts. (All being released between January-March 2015. Also click on the title for a full, proper synopsis from Goodreads-sorry it’s late and my brain is mush). Almost Famous Women: Stories by Megan Mayhew Bergman. You guessed it, stories about those women who were almost famous but not forgotten. Descent by Tim Johnston. I’ve been hearing a lot of buzz about this book since BEA this year. Hopefully the blurb about it being “A riveting literary thriller of the can’t-stop-turning-the-page, stay-up-all-night variety.” will hold true. I Was Here by Gayle Forman. I don’t read much YA but when I do, Forman is one of my go-to authors. The Undertaker’s Daughter by Kate Mayfield. Mayfield’s memoir of growing up in a small town as an undertaker’s daughter is being described as a combo of Six Feet Under, The Help, Stiff and reads like a Harper Lee novel. A Spool of Blue Thread by Anne Tyler. I have never read anything by Pulitzer Prize winning Tyler but 2015 is her 50th year celebration as a writer and I might just pick up this Book Club buzz book. A Touch of Stardust by Kate Alcott. It’s Kate Alcott and Historical Fiction and takes you behind the scenes of the filming of Gone With the Wind and the somewhat forbidden relationship between Clark Gable and Carole Lombard. Intrigued. Delicious Foods: A Novel by James Hannaham. Three characters: a mother, a son and the drug that tries to destroy their lives. Not a light read but the these are the types of books I never forget. Funny Girl by Nick Hornby. So much confusion…originally published in paperback and untitled in 2014 but not yet released here in Hardcover until 2015. I don’t care. It’s Nick Hornby. A Little Life: A Novel by Hanya Yanagihara. Just look at the cover!! I’m terrified and anxiously eager to read this book that topples out at 736 pages. I hemmed and hawed about requesting it but decided to go for it as my first request for 2015. I read the blurb and it sucked me in. I figure if I start it right away I will have it done by it’s release date in March 2015. And I missed The People in the Trees by Yanagihara in 2013, so I need to do that too. But seriously, read the synopsis…I dare you! Dead Wake: The Last Crossing of the Lusitania by Erik Larson. I haven’t read any of Larson’s books since The Devil in the White City and loved it, so it’s going on my list! 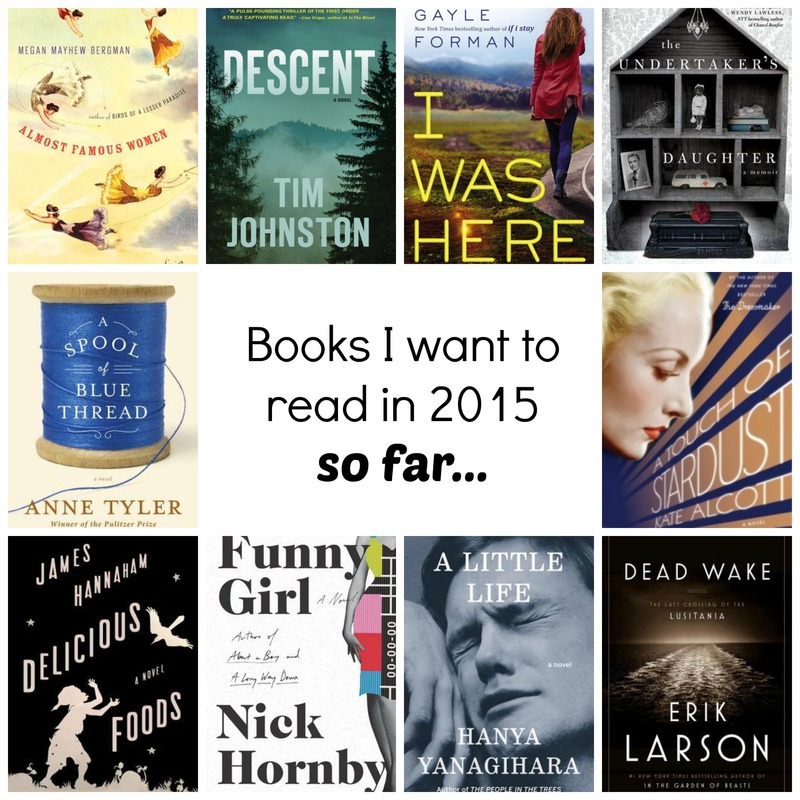 Have any interesting and/or “must reads” for 2015? Tags: 2015 new releases, 2015 new releases January-March, Top Ten Tuesaday. Bookmark the permalink. I am beyond excited for Almost Famous Women and A Little Life! I’ve already put a hold on Funny Girl by Nick Hornby and I just finished one of Erik Larson’s books, so I definitely will be looking for that one.